Most of the discussion these days on how to improve e-mail response centers on technical issues such as deliverability, spam filters, and readability on mobile e-mail clients. It’s easy to forget, therefore, that the true keys to e-mail success are often none of the above, but rather more old-fashioned principles relating to message and offer. Case in point: the Webinar invitation below from Oracle. If you were to score this e-mail based on deliverability and readability, the company does a lot of things right: Minimal graphics. A well-placed reminder to add replies@oracle.com to the reader’s address book. A headline in HTML (which will therefore display even if the recipient has images turned off in Outlook). And so on. * The overall message is disjointed and generic in the extreme. What’s the key takeaway here? More sales, less admin? Better performance? Rapid time to value? The subject line, headline, and title of the event each present a different message, which means that instead of reinforcing each other, they compete and distract. * I’m particularly confused by the headline and accompanying photo. First, the image is one of those cliché, instantly forgettable, man-in-suit-leans-to-break-tape-on-running-track stock photos. Secondly, and more critically, what connection does “Better Performance On Demand” have to the event itself and the value of attending? I would argue: nothing. * CRM is not news. For the most part, CRM is a replacement market – i.e. most companies of any size have some kind of system in place, even it’s only Excel. Why then does the invitation seem to be trying to convince me that I need a CRM system, and in the most tired, lukewarm terms? More sales, less admin? Puhleeze. Is that truly a distinct competitive advantage? Moreover, is it a reason to attend a Webinar? * To give some credit, at least the bullet points attempt to deliver some specific learning benefits. But the first of the three (“How Oracle CRM is helping companies like yours to grow revenues and serve customers faster”) is the weakest, simply because it sounds like a claim most every application software company on the planet could make. * The subject line is mostly wasted space. Here it is in its entirety: “More sales, less admin: Oracle CRM On Demand: LIVE WEBCAST August 13th.” In an era when subject lines get at most a split second’s attention, every word has to work hard. 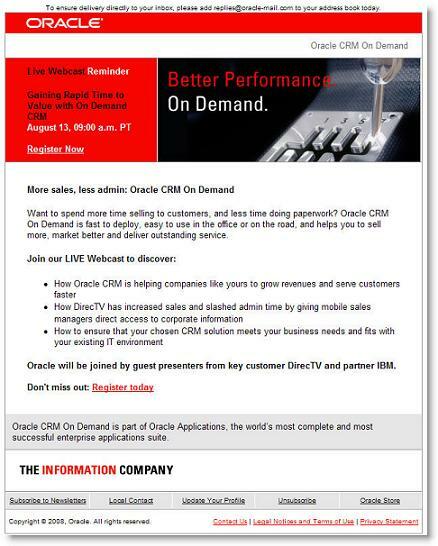 “Oracle CRM On Demand” may be a topic, but it does nothing to grab my attention. And why do I need to know the date of the Webinar in the subject line (especially when, at 60+ characters, few recipients are going to see the date anyway)? This entry was posted in B2B Marketing, Copywriting, Creative, E-mail, Webinar Invitations, Webinars and tagged email creative, email design, email marketing, Webinar Invitations on August 29, 2008 by Howard Sewell. Even if 1) this email had been written ten years ago and 2) the copy (as it is now) limited itself to only one of its ‘messages’… would it still fail? For one, who is the audience? A small businessperson is certainly going to have different day-to-day needs from someone in a larger organization. And so you have *no* reason to spend any more time with this email when you’ve got so many other emails — so many other *priorities * — begging for your attention.